Google’s got a new travel app that will be launching soon. The app will be called Trips. 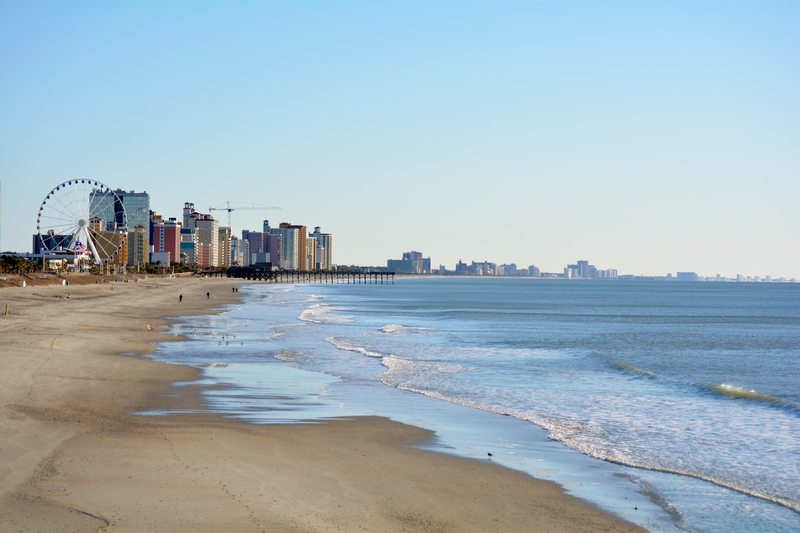 This app will make planing your Myrtle Beach Vacation and scheduling your Family Beach Portrait Session even more fun and easy. Your air travel, hotel, dining and sightseeing reservations will be collected in one convenient app. In addition to google collecting your online planned trips, you will be able to add things you want to do manually with the app. You will be able to add review and photos from your travels. Click over and sign up for local guides (https://www.google.com/local/guides/) to be the first to check out this crazy convenient new app. We think that Local Guides will be the place Google will announce the Trips app. 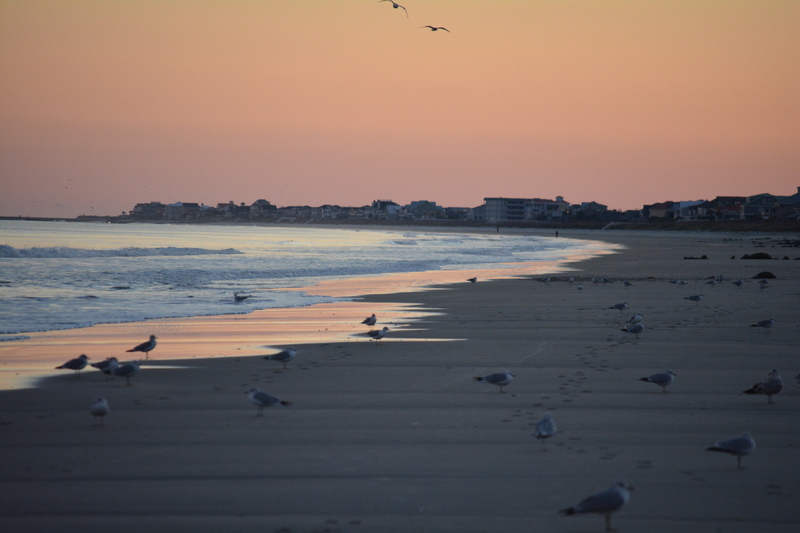 In the meantime, give MyrtleBeachPhotography.com to book your Family Beach Portraits or call 843-236-5403. Remember, we have live chat not for those of you who can’t call. Alligator Safety after Alligator Attack of Child in Orlando Fl. Because of the recent tragic alligator attack of a small child in Orlando FL, Myrtle Beach Photography wanted to give our visitors some real facts about alligators to help keep you and your family safe. These facts were provided by the South Carolina Parks and Recreation. Myth: Alligators can grow to enormous proportions, over 20 feet in length and weighing a ton or more. Fact: The longest recorded length for an alligator is 19′ 2′. This animal was trapped in the early 1900’s in the State of Louisiana. Most wild alligators do not get above 13 feet in length, and may weigh 600 pounds or more. Also, the weight of an alligator can vary greatly in relation to its length. Myth: Alligators live for hundreds of years. Fact: Alligators in the wild are believed to live 35-50 years. In captivity their life span may be significantly longer, perhaps 60-80 years. Currently, there are no scientific methods of analyzing an alligator’s age while it is alive. Myth: Alligators will chase people. Fact: Bigger gators shy more readily. That’s how they lived to be so big. 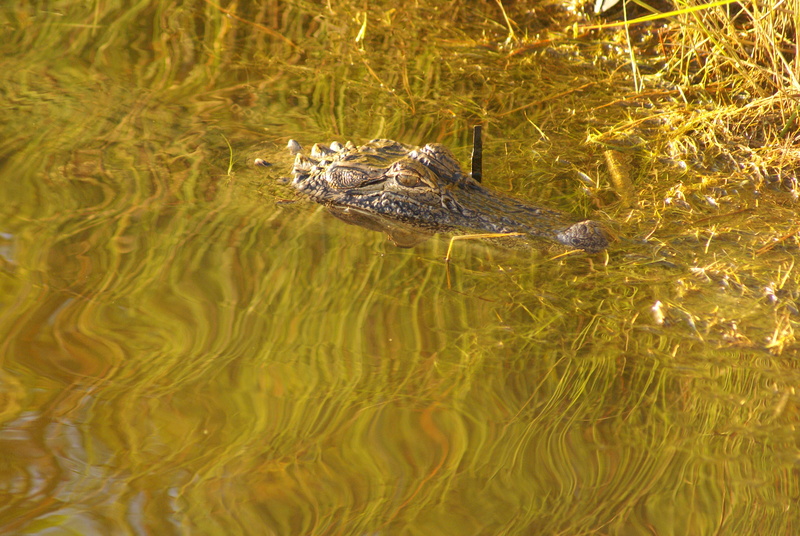 Myth: You should run zigzag if you come across an alligator. Fact: This is a common misconception. First, it is rare for an alligator to pursue a human because humans are too large to be suitable prey. However, if an alligator does make an aggressive charge, run fast and straight (away from the alligator, of course). They usually do not run very far. But remember they are most likely to charge at you if you are near their nest. Myth: Alligators have poor eyesight. Fact: Alligators actually have very good eyesight, which is an important adaptation for hunting. They are especially adapted to see and sense movement of potential prey animals. The position of their eyes on their head (almost on the side) gives them a wide sight range. The only place they cannot see is right behind them. Myth: Alligators are not good climbers. Fact: Alligators have sharp claws and powerful tails to help them push their bodies up. Young alligators are agile climbers and adults have been known to climb fences to get to water or escape captivity. Low fences, therefore, may not be sufficient protection for pets in areas where alligators are present. Myth: Alligators make good pets. Fact: This is entirely untrue. Alligators make terrible pets. Although baby alligators may seem like a cool pet, it is illegal to possess or take an alligator without the proper licenses and permits from the SCDNR. 7-8 feet in size is when alligators can really start injuring people and taking dogs. Most attacks on humans are by animals 9-10 feet or larger. Most alligator problems occur between early March and July which is the breeding season. At this time of year, they are also generally more visible because they want to get out of the cold water and warm up in the sunshine. Never get closer than 15 feet to an alligator. If it hisses or opens its mouth in defense, you should back away even farther. Alligators located at the water’s edge may act quite differently from those that are landlocked. Alligators should retreat into the water at the approach of humans. If the alligator lets you get very close without some defensive action on its part, it is demonstrating problem behavior. Alligators six feet or larger present the greatest hazard. Smaller alligators, four feet or less, pose little threat. However, NEVER toy with the smaller alligators. They may actually be babies or adolescents, and the mother may be nearby. Keep a VERY wide margin. Alligators can be surprisingly quick on land and are capable of running short distances in addition to lunging at you with explosive force. Most attacks occur while the victim is at least partially in the water. Work in pairs and stay alert when working in or near fresh and brackish water. Remain aware of your surroundings by alternating responsibilities so one person is always on the lookout. Most attack victims report they were unaware of the alligator’s presence until the last minute. Never feed or entice alligators – it’s dangerous and illegal. When fed, alligators overcome their natural wariness and learn to associate people with food. Inform others that feeding alligators is illegal and creates problems for others who want to use the water for recreational purposes. Feeding alligators creates a danger for everyone. DON’T feed any wildlife in or near the water. Dispose of fish scraps in garbage cans at boat ramps and fish camps – do not throw them in the water. Those people who feed any type of animal living near the waters edge, or anglers who throw fish scraps into the water, are playing with fire. Although this is not intentionally feeding alligators, it creates a situation where the alligators see these events and begin to associate people as a food source. Alligators are most active between dusk and dawn. Therefore, swim only during daylight hours. Large alligators feed most actively during the evening hours. DON’T swim or allow pets to swim in areas with emergent vegetation (plants growing up out of the water). Alligators favor this type of habitat. Swim in designated areas only. DON’T let pets swim, exercise, drink from, or run along the shoreline of waters that may contain alligators. Alligators are attracted to dogs probably because they are about the same size as an alligator’s natural prey. Leave alligators alone. State law prohibits killing, harassing or possession of alligators. DON’T try to remove alligators from their natural habitat or try to keep one as a pet. It is strictly against the law to do so and is dangerous. Alligators do not become tame in captivity and handling even small ones can result in injury. Observe and photograph alligators only from a distance. Remember, they’re an important part of South Carolina’s natural history as well as an integral component of freshwater ecosystems. 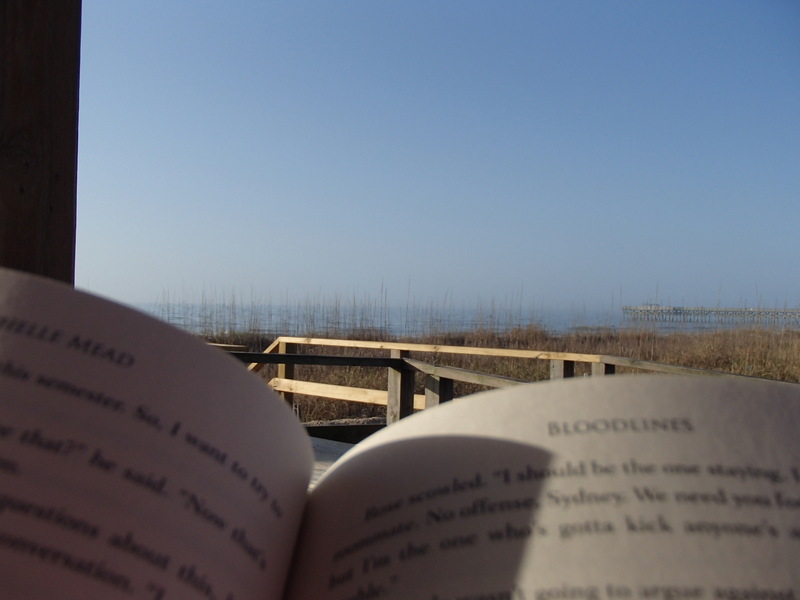 DO fence your waterfront property. Appropriate fencing helps protect family and pets against incursions by alligators. Keep an eye on Myrtle Beach with Earth Cam. 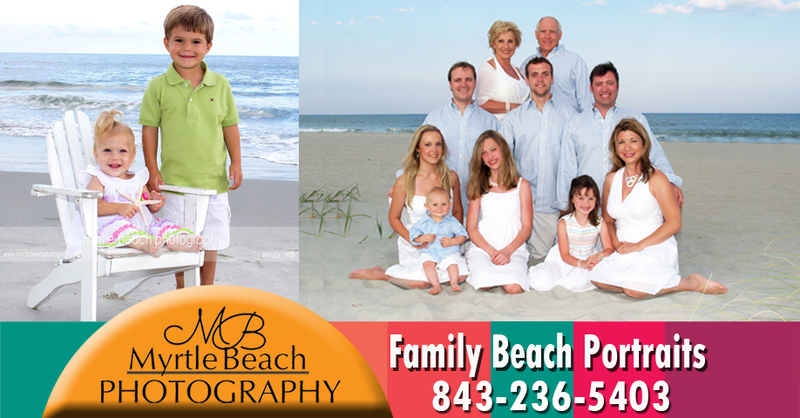 If you are interested in a family beach portrait call 843-236-5403.